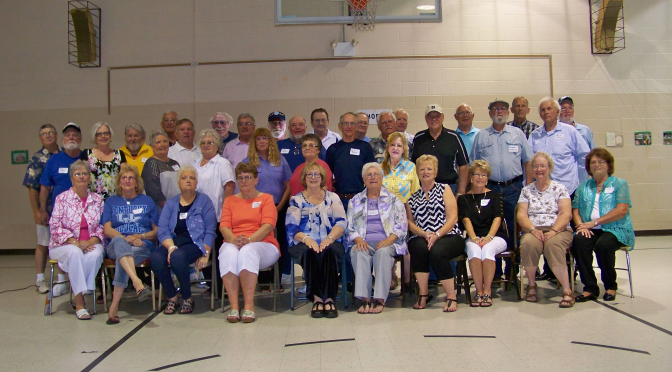 Monrovia Class Of 1964 Held Their Fifty Year Reunion! The Monrovia High School class of 1964, held their fifty year class reunion on June 8th in the gym at the Historic Hall School house. According to a class spokesperson, “this was a great time for renewing old acquaintances and catching up on what has happened over the last fifty years”. They also mentioned what a great facility the old gym was for hosting this kind of event and said the “Hall Civic Association did a tremendous job of setting it up for our reunion”. Hall Civic president, Randy Marsh said the gym is available for rent for wedding receptions, class reunions, family reunions or just about any gathering where you need room for a large group. Randy said the rent is only $25 per hour which makes it very affordable for most anyone’s need. You can call Randy Marsh at 317-430-8023 for more information, or visit the Hall Civic Association web site at www.hallcivic.org.